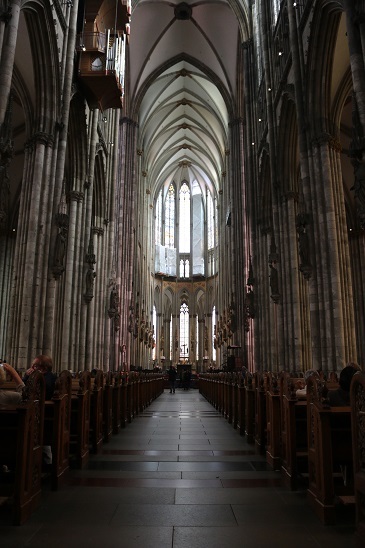 Cologne Cathedral, Kölner Dom to the locals is the crown jewel of Cologne. 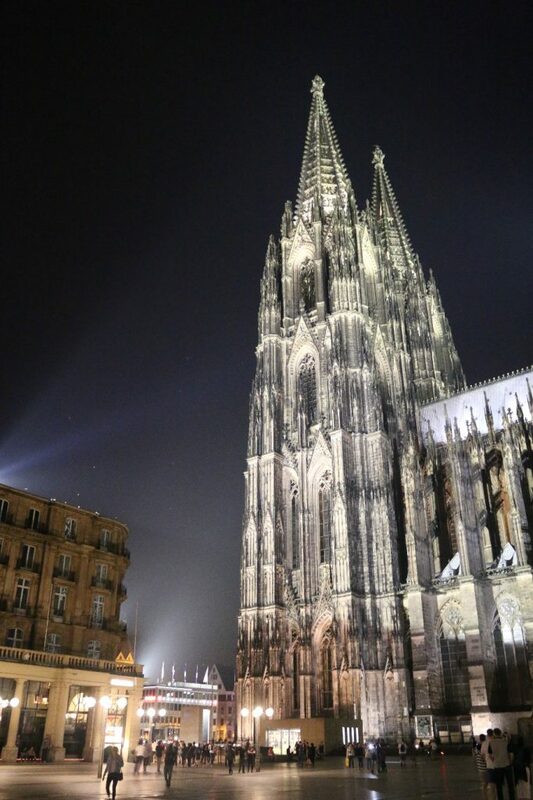 It is a gothic style Roman Catholic cathedral that construction started on in 1248. The dom is on the UNESCO World Heritage List and is Germany’s most visited landmark with an average of 20,000 people visiting every day! It is also somewhere I’ve been fortunate enough to go to several times and each time I see something new. From 1880 to 1884 it was the tallest building in the world. 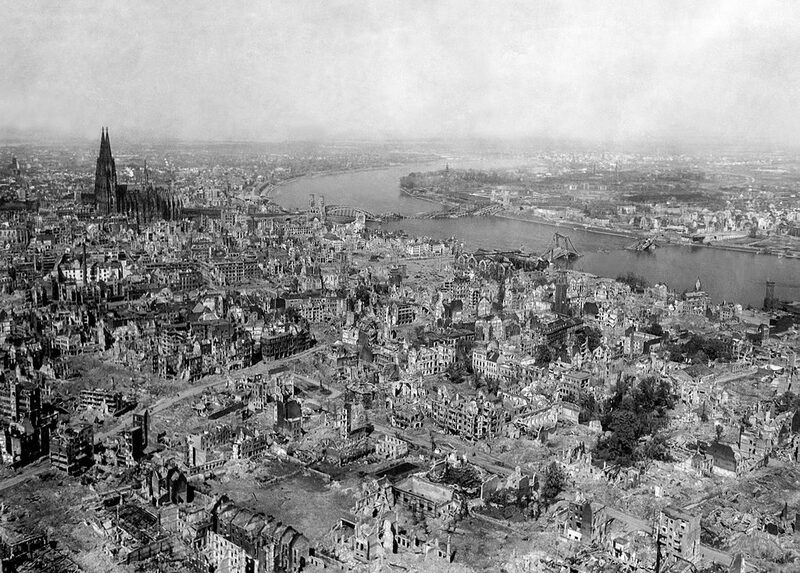 During World War 2 it was the target of 14 separate aerial bombings and though it was badly damaged it survived in an otherwise flattened city. 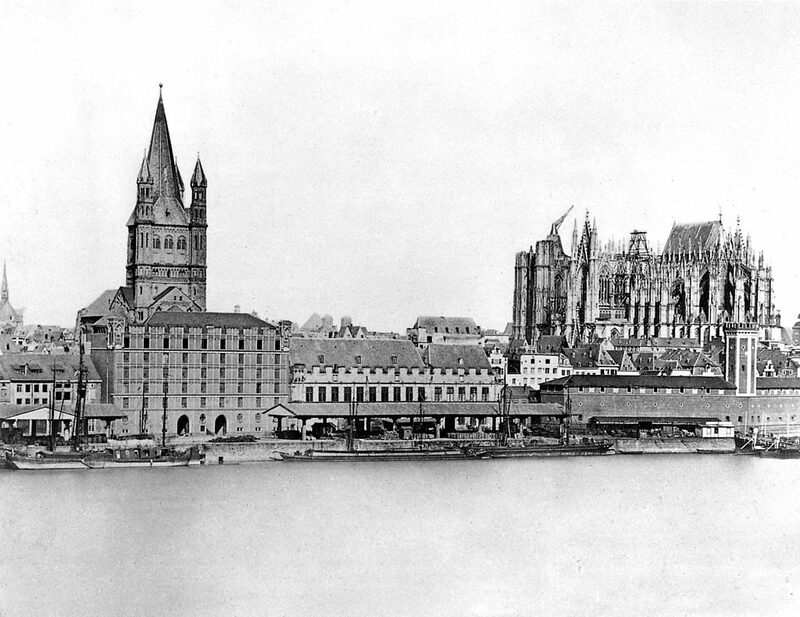 Cologne itself was subject to 252 different air raids by the Allies. You can see an old photo taken in 1945, years after the first bombings took place the same year the Americans captured the city. That the cathedral managed to stay standing is something of a miracle. 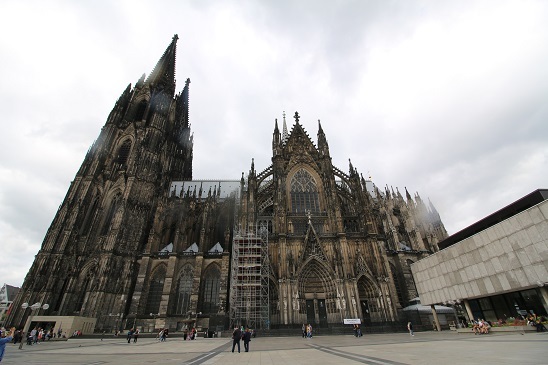 Getting to Cologne Cathedral is rather easy. There’s a very good chance if you arrive in Cologne and you’re on a train you will end up at the main train station, Köln Hauptbahnhof. From there it is simply a matter of walking outside. One side of the train station has McDonald’s, the other, the cathedral. If by chance you don’t end up going through the Hauptbahnhof then head to the historic part of town and walk along the river. You really can’t miss it. One thing you should know before you go is that there is nearly always scaffolding on the outside of the cathedral. This is because there is near constant work being done to restore the building and keep it in prime condition. 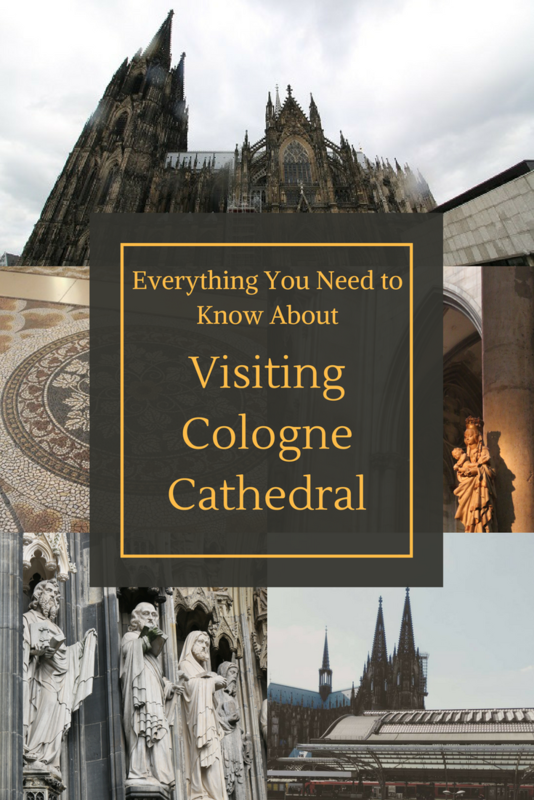 Cologne Cathedral is a beautiful work of art but there’s so much more for you to do besides look at it. During mass the cathedral is closed to tourists and this might actually be the best time to see it! You’ll get the experience of seeing the cathedral used for its intended purpose and you won’t have to battle the crowds. However, I imagine they will kick you out if you even think about breaking out a camera so be respectful while you’re there! 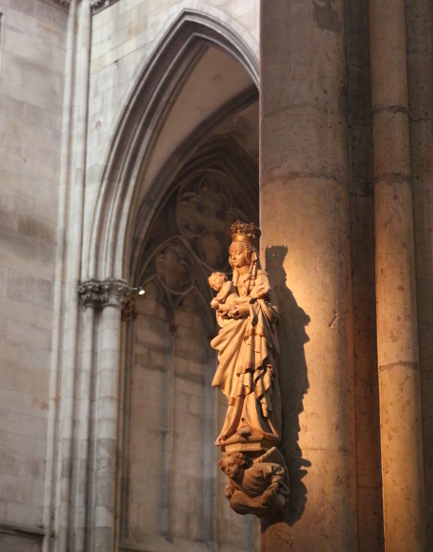 Cologne Cathedral is home to many different treasures but the most prized is the massive reliquary called Shrine of the Three Kings. You may be able to guess what’s inside, yep, the bones of the Three Wise Men. It’s on display behind the altar in the cathedral. Their treasures don’t end there, in fact, they have an entire treasure chamber which is filled with golden treasures. I’ve not been inside the treasure chamber yet despite having been to the cathedral so many times. There is a €5 entrance fee for adults. One of my biggest regrets around the cathedral is that I haven’t been able to make the climb up the tower. Why? There are 533 steps between the ground and the top. I’ve been told that the views from the top are amazing and you can see the countryside around Cologne on a good day. What is most interesting to me though is being able to go past the bells. There are eight bells in the cathedral, the largest is 24,000 kg (52,910 lbs) and is actually the biggest freely swinging church bell in the world. You can even see them in action if you book a special tour. You have to be at least 16 to go on the tour and it is in German, though you shouldn’t let that stop you. They also have quite a few other special tours that look really interesting. The inside of the cathedral is gorgeous. There really aren’t words to describe it, so I’ll leave you to enjoy a few photos I’ve taken through the years. 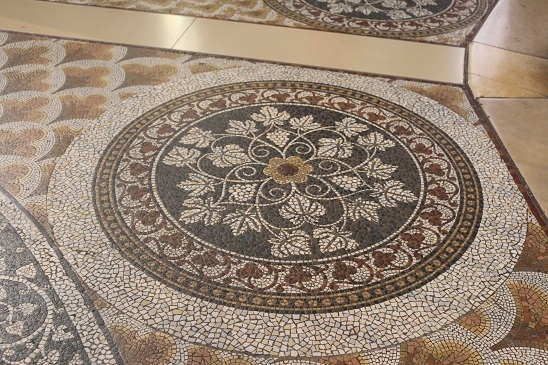 What I would say though is while your eyes are naturally drawn upwards by the shockingly tall ceilings make sure you look down too as the floor inside is covered in a magnificent mosaic. I’ll be honest with you, as much as I love how beautiful the cathedral is inside I love it even more on the outside. I adore the gothic architecture style and find it quite inspirational as a photographer. I’m not sure how the cathedral does it but anytime you’re taking photos of the outside the sky is always perfectly blue, which almost makes it feel like the image has been faked. Or maybe that’s just my luck. On the Hauptbahnhof side, there is a lovely wide set of stairs. Or at least they’re stairs in theory. More often than not they’re impromptu seats for people to enjoy the area’s atmosphere. I love going there to people watch and it’s my second favorite place to spend warm evenings after Heumarkt. The other side of the cathedral is where Cologne hosts their yearly Christmas Market. I’ve heard it is one of the best in all of Germany. I always go to Cologne in August though so I couldn’t say. Yes! Aaaand no. If you want to see the inside and outside of the cathedral from the ground floor then yes! You absolutely can do that. But if you want to do any of the special tours, climbing the tower, any of that…you will be disappointed I’m afraid. Don’t let that stop you from going though, what you can see is amazing and well worth it.